Enhance your productivity by turning your Windows® USB-C™ laptop into a full-scale workstation. This dual-monitor USB-C dock lets you easily connect two HDMI monitors or DVI monitors (with included adapters) using one USB-C cable, with no setup of display drivers required right out of the box. 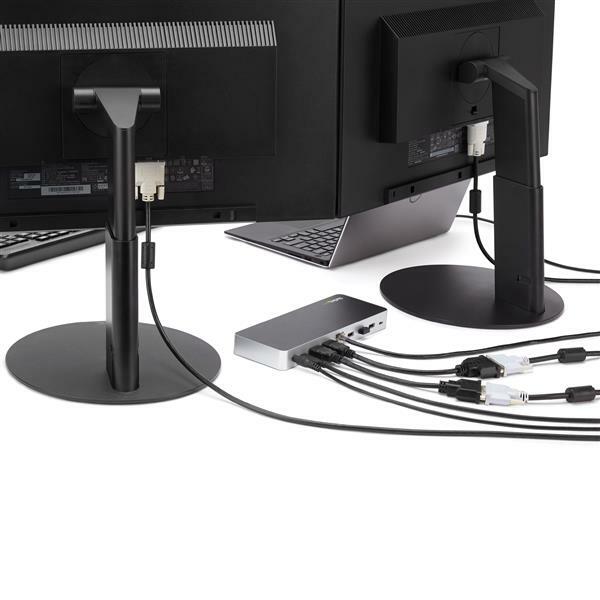 The USB-C dock provides 60W charging power, and five USB 3.0 ports to connect devices. With easy dual-monitor setup, the dock is ideal for wide-scale use in office workstations. You can also connect a single 4K HDMI display. 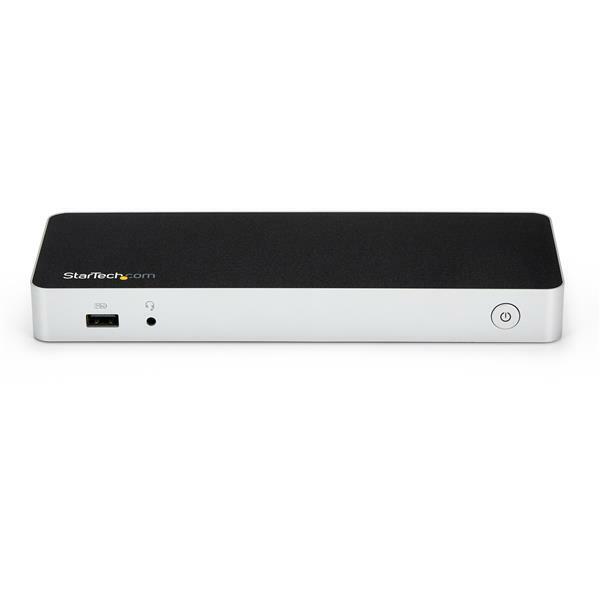 Unlike some USB-C docks that may drop to USB 2.0 and limit Ethernet performance, this USB Type-C™ dock offers full USB 3.0 and network bandwidth. This provides faster data transfer speeds when using your USB 3.0 peripherals and supports true Gigabit Ethernet network throughput. 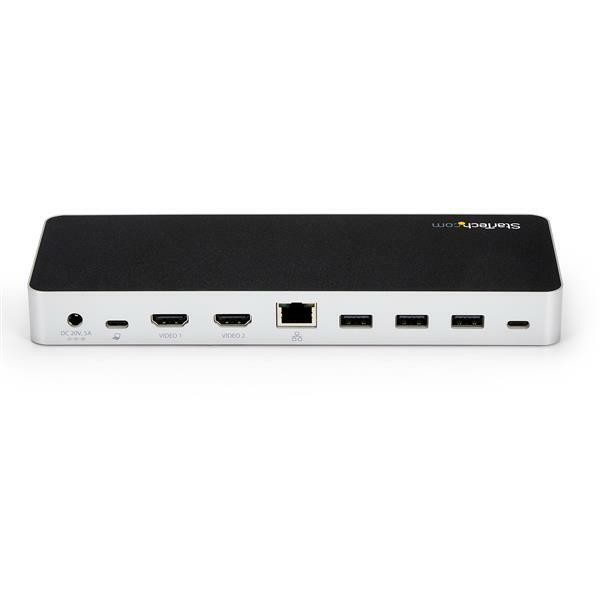 This USB Type-C docking station gives you five USB 3.0 ports (1x USB-C and 4x USB-A including 1x Fast-Charge), a Gigabit Ethernet port (PXE Boot support), plus audio and microphone connections. The USB-C docking station with Power Delivery will power and charge (up to 60W) your laptop, while powering your devices. The dock features automatic driver installation for easy setup. It works with Windows based laptops with a USB-C port that supports DP Alt Mode and USB Power Delivery. The MST30C2HHPD is backed by a StarTech.com 3-year warranty and free lifetime technical support. Ensure your laptop’s drivers, firmware, and operating system are current prior to using the docking station. Video output capabilities depend on the video card and hardware specifications of the connected laptop. Not all USB-C ports support the full functionality of the USB Type-C standard. Ensure that your laptop’s USB-C port supports DP Alt Mode and USB Power Delivery for the full functionality of the USB Type-C standard. Note Ensure your laptop’s drivers, firmware, and operating system are up to date prior to using the docking station. 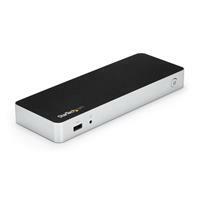 (5 stars) Great dock with lots of features! This is a great USB-C dock with dual monitor (hdmi) support. Has one (1) USB-C port along with four (4) USB-A ports and power delivery for your laptop. GB network port is also available making this docking solution complete. Ease of use is all I can say about this dock as everything worked as it should via plug-n-play. I received this product in exchange for an unbiased review. (5 stars) Great Solid device! Sturdy with some substance, does not feel cheap and' plasticy' as many small docks of this size tend to feel. The rubber feet are a nice touch and protect your desk nicely. Everything worked like a charm, just plug and play. Up and running with 3 more displays now. I also like that it has a power button so its not just another 'always on' device in the office over the weekend. Disclaimer: I received this product in exchange for an unbiased review. 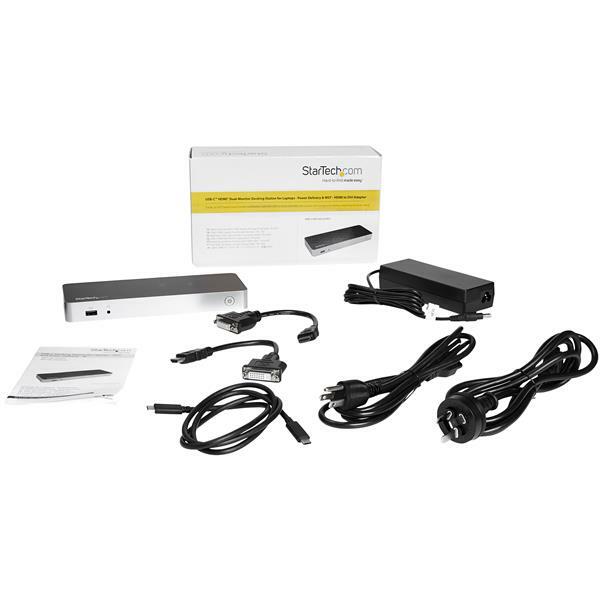 (5 stars) Great dock with lots of features. I found this had all the ports I was looking for (Ethernet and multi-monitor). Everything worked plug and play, and I didn't have to fiddle with drivers but make sure you wait for Windows to automatically find and install the drivers. It took a few minutes for everything to be recognized. Everything seems to work as expected and it's driving my multimonitor setup from my laptop just great. It also came with a couple dongles to change the HDMI to DVI to support a wider range of monitors which was great. I didn't need them, but I could use them elsewhere, so it felt like getting 3 products for one. I received this product in exchange for an unbiased review. (4 stars) Great to add the extra LED!!! Got this for test and I had to finally get the 2 led monitor for my laptop ( yeah..) I have been using it for the past 2 months without a problem and does the job for a good market price. We tested it on 3 different laptop brands with the same results. Disclaimer: I received this product in exchange for an unbiased review. (5 stars) I love this Dock!! Talk about a great product. First off, Setup was a breeze just plug in and it works. The unit has power delivery for people who want to power their laptops without needing their original adapter plugged in. 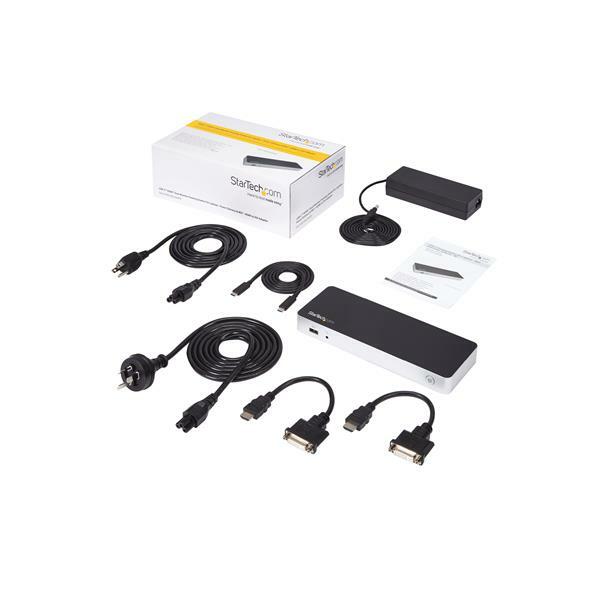 This gives dual HDMI which can be converted to DVI with supplied adapters. The option to use an Ethernet cable is great in my office as my wifi signal is limited. This unit has lots of Standard USB ports for all your peripherals. This dock is great. It works perfect with Windows 10 as far as I could see during my test of this product. Remember this is a windows only product so go for the Thunderbolt 3 version if you want it to work perfectly with a Mac. I would recommend this product to anyone who wants a simple setup and lots of connectivity through simple one cable hookup. The unit has a little bit of weight which i found perfect for not having it slide around on my desk. Some docks are way too light. I think they found a great balance of weight vs functionality with this dock. I received this product in exchange for an unbiased review.